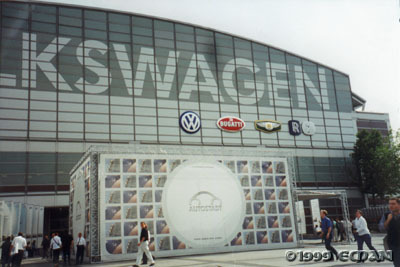 FRANKFURT, GERMANY (September 20, 1999) -- The Frankfurt Internationale Automobil-Ausstellung (IAA) is big. No, that’s wrong. This show is HUGE. The only reason why I didn’t have more pictures is because I got tired of walking around (that and jet lag). This auto show is held every other year. It is a combination auto show / Society of American (SAE) show. Both automobile manufacturers and suppliers have displays. The stands are spread out over nine (9!) different halls. I never even made it to the DaimlerChrylser display (again). ~ Most Interesting Display: It was raining at the Saab booth. ~ Best Giveaway Brochure: The Porsche Boxster brochure is a hard cover book. ~ Car I Wanted To Steal The Most: McLaren F1 at the 100 Years of the Automobile display. ~ Car I Really Wanted To See But Walked Right By: The Audi RS4 Avant (station wagon wtih 360 hp twin-turbo V6 and quattro). I’d show you a picture, but I walked right by it! ~ Biggest Lust-Inducing Item: After my girlfriend, the 1993 McLaren F1 on display. ~ Biggest Disappointment: BMW didn’t show the upcoming Z8 (or I missed it). This particular building housed just a few of Volkswagen’s many brands.